You have multiple options when handling a received fax. You have the ability to Reply, Forward, Export, or Print the fax that you received. The following will demonstrate how you can handle the fax in the different methods. Once you have logged in you are taken to your inbox. To reply to the fax that you have received you will need to select the fax by checking the box next to the fax and the select the “Reply” option. After you select “Reply” you will see the outgoing screen. Here you will see the number pre-populated to reply to as well as the document that was faxed to you. You can remove the fax and upload a different document if you choose. To do so select “Remove” which will remove the fax and then you can either add a document from your library or upload a document. 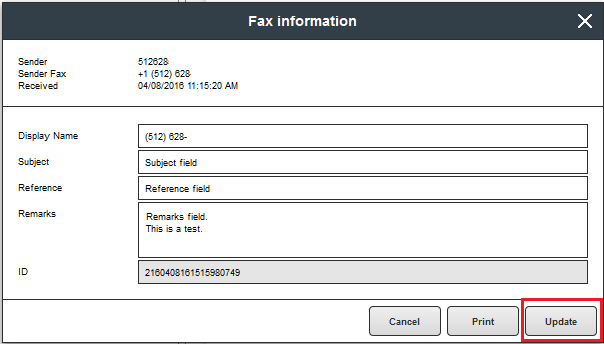 Once you have the information ready you can select “Send” to reply to the fax. To forward a fax that you have received you will need to select the fax by checking the box next to the fax and then select the “Forward” option. After you select “Forward” you will see the outgoing screen. The document is populated for you and you can add to this by either adding a document from the library or by uploading another document to fax with the original. 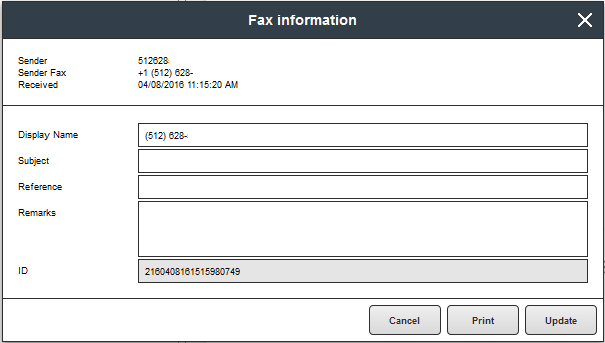 Once you input the recipient information you are then able to forward the fax by selecting “Send”. To export a fax that you have received you will need to select the fax by checking the box next to the fax and then select the “Export” option. After selecting “Export” you will be presented with three sets of options when exporting the document. You can export the document as a PDF or TIFF file. You have the ability to select which pages to export. 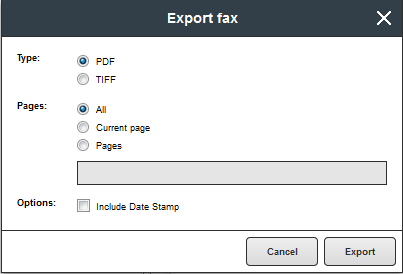 You can select all pages, the current page, or you can select specific pages from the fax to export. Once you have made your selections to the type of file and page selection select Export and the fax will download to your computer. Depending on your browser you may be prompted to save the file to a certain location or the file will download to your default location. To print a fax that you have received you will need to select the fax by checking the box next to the fax and then select the “Print” option. When you select the Print option this will then download the file as a PDF and you will then be able to Print the fax from your PDF viewer. Sfax does not submit the fax to your printer directly. To view information about your received fax you can check the fax you would like to review by marking the fax the selecting the Information button. After selecting the information button you will see the information about the selected fax. You then have the ability to add additional information to the Subject, Reference, and Remarks fields. This information can be used to assist when searching for faxes. Once you input the information into the text fields you will need to select update for the changes to take place. You will then see the information listed with the fax that you added this information to. 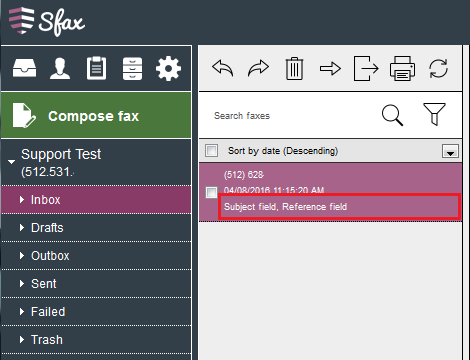 You can also use the search field to search your inbox with the criteria that you added to the fax.